AFTER the troubling events of recent times, it must have come as a source of great comfort to every Irish person this week to discover that at least the ‘Welcome’ sign in Las Vegas will be coloured green for St Patrick’s Day. Thank goodness for that. Because, whatever else we might have to complain about in respect of how this luckless island is being governed, at least our leaders are still tirelessly marketing us as a product. In fact, so diligent has the government been in ‘positioning our global brand’, that Ireland must be fast becoming the Ronald McDonald of the international community. “Even the Pharaohs are going green this year to mark The Gathering,” said Varadkar, without any apparent sign of embarrassment (although it is always hard to tell what the smooth-faced tourism minister is really thinking). Similarly, another source of national pride was trumpeted this week on the Irish-American news website, Irish Central. ‘Old Spanish document suggests Irish were in America before Columbus’, declared Irish Central, linking to an article that was published back in the mists of time, in 2011. And even though, by online news standards, that made the story practically archaeological, nobody minded. It was another much-needed opportunity for national self-praise and was gratefully seized on as such. The story goes that a colony of Irish settlers was living in what is now South Carolina at the time of Columbus’ 1492 voyage. 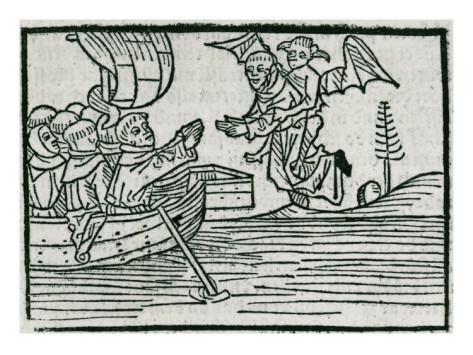 The source is Peter Martyr d’Anghiera, a 16th century Italian-born historian who chronicled life in the New World in 1526 in ‘De Orbe Novo’. He interviewed Spanish colonists in the area, who told him about another colony of Europeans nearby known as the Duhare. But why are the Duhare thought to have been Irish, I hear you ask, all in a clamour? Which of our charming national characteristics did they flatteringly reflect? Wit? Affability? Cultural clout? Did they punch above their weight too? How is our patriotic pride to be satiated? Here’s what the Duhare were reportedly like: they were taller than the Spanish, and had grey eyes and long reddish-brown hair. So far so Celtic. Their king was named Datha, which sounds like Daithí, you’ll agree. Datha was a tattooed giant whose wife was as tall as himself, and they had five children. It’s a scanty enough depiction of a people, admittedly, but it’s amazing how far you can get with those few broad brush strokes. By adding the merest dash of Gaelic imagination, they quickly begin to appear exactly like an Irish family – perhaps an Irish family after the fashion of a 16th century John McGahern. You’ve got your hulking, scary men, your strong, taciturn women allowing Things to Go Unsaid, your huge-eyed children learning to love by fear… Does anyone else feel a film coming on? This story about the Irish discovering America also meant the digging up and dusting down of another worn-out old riddle – that of the Reinhardt boulder, a carved rock found in the state of Georgia bearing glyphs that are strikingly similar to those found on a rock in the Dingle Peninsula. Anyone in Kerry will give you the simple solution to that puzzle, reminding you that St Brendan the Navigator visited the States long before it was either profitable or fashionable to do so. The sixth-century monk, from Fenit, Co Kerry, went on a fabled expedition to the Isle of the Blessed, described in ‘The Voyage of St Brendan’ and recreated by the explorer Tim Severin in the 1970s. After seven years of sailing, Brendan and his fellow pilgrims believed they had found paradise. “Arra lookit,” St Brendan must have remarked when he arrived back home, having got lonely for Kerry. “Amn’t I after leaving my petroglyph outside in America? Well sugar it anyway.” St Brendan, you will notice, spoke something like a character played by Barry Fitzgerald and directed by John Ford. It’s how we’re positioning him in the global tourist market. So that’s the mystery of Ireland’s imperial past cleared up. The only remaining question relates to the conduct of the early Irish colonists in the New World. Naturally we hope they will have been wonderfully pacifist and mystical, like those fetishised Native Americans. No one would like to think the Irish were more bent on pillage than tillage. But never mind about that. We don’t have to worry about that either way. We’ve got Glas Vegas.